Pinoy Pride 36 "A Legend in the Making" ticket is now on sale. 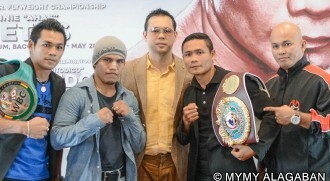 Pinoy Pride 36 will be headlined by Donnie "Ahas" Nietes vs Raul "Rayito" Garcia of Mexico, also included the title eliminator fight between Milan Melindo vs Javier Mendoza of Mexico. This event will be held at La Salle Coliseum in Bacolod on May 28, 2016. For inquiries, ticket buyers may call the numbers 0925 499 8493/0917 872 5297/(034)435 0553/(032) 505 9513.